Circular Brilliant Cut is a new name for an antique stone. 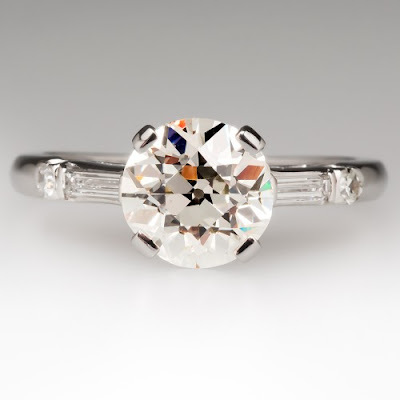 You've likely heard of the popular antique nomenclatures Old Mine and Old European (Old Euro) diamonds. You've also probably heard of the ubiquitous Transitional Cut. However, unless you pay very close attention to the buzz about GIA gemstone grading, you might not have heard of the Circular Brilliant Cut. The lower half length of the stone must be less than or equal to 60%. The star length must be less than or equal to 50%. The culet size must be medium or larger. All three requirements must be met for a diamond to qualify. The table size must be less than or equal to 53%. The crown angle must be greater than or equal to 40 degrees. The lower half facet length must be less than or equal to 60%. The culet size must be 'slightly large' or larger. The star length must equal 55%. The culet size should be 'NON' to small. Perhaps you have or plan to purchase a transitional cut diamond that has been previously graded (prior to 2013) as 'poor' or 'fair', or which does not have a cut grade listed on your GIA report. If that is the case, may we recommend contacting the GIA to inquire as to whether your stone might qualify for a reevaluation according to these fairly new Circular Brilliant Cut guidelines? Pay, Duncan. "Describing 58-facet Round Brilliant-Cut Diamonds at GIA," GIA Blog, December 20, 2013. "Estimating a Cut Grade," GIA Grading System, accessed July 24, 2015.